"The first real revelation of my life was when I was about nine years old and I put on a station called WBAI in New York which does [Wagner's] entire Ring cycle. I must have come in the middle of Die Valkyrie or something but I remember hearing the next seventeen hours without even moving - at least in my mind - but I never got out of bed. It was the most thrilling thing I ever heard. I was just blown away. Right after they played it, they played Anna Russell's Ring cycle and I felt just as moved and thrilled by her parody of it. I'm sure that really affected me. There was something very important about the silliness and the grandeur as they co-exist. It wasn't just that it was incredibly funny but she made you relive the whole thing - so you really relived the beauty and the greatness of it. And the comedy was such that you realized the thing is silly and magnificent at the same time. That's been one of the guiding principles for me ever since, I'm sure, that some of the greatest things are silly in a glorious way. They are more extreme than real life and that makes them sillier and also more magnificent. There's nothing more silly than an opera but there's also nothing better." Songwriter and producer Jim Steinman has built a career out of extremes - not by treading among the grandiose, the dark and the absurd, but rather by helping himself to equal parts of each. Called "The Phil Spector Of The '80's" by Billboard magazine and "The Richard Wagner Of Rock 'n Roll" by the LA Times, Steinman's distinctive sound is as big as America itself. But it was Meat Loaf's Bat Out Of Hell (which he co-produced and wrote) that first brought him into prominence. Lately, however, Steinman has a new card up his sleeve: a quartet of female lead vocalists called Pandora's Box (named after the 1928 German movie starring Louise Brookes) which is designed to be another classic creation by the fertile imagination behind Meat Loaf's breakthrough LP. Selling an astounding 17 million units, Bat Out Of Hell has remained in the UK Top 200 since its release in 1977 and still sells many, many thousands of copies every year in the UK alone. "We didn't know it sold 17 million because we gave up following it in 1981. I had no idea." Why did such the successful partnership of Steinman and Meat Loaf break up? "Basically I only stopped working with him because he lost his voice as far as I was concerned. It was his voice I was friends with really," Steinman says with remarkable candor. "In his mind, I was his best friend but I never was. It was his voice. I liked him but it was a package deal - without the voice it was a little hard." Despite an anti-climatic solo album and Meat Loaf's second LP Back Into Hell, Steinman continued to pen successful songs. All bear his unmistakable watermarks: sweeping melodies with mysterious, operatic arrangements which can only be performed at an emotionally feverous pitch. Total Eclipse Of The Heart and Holding Out For A Hero, both Steinman songs, were smash hits for Bonnie Tyler. 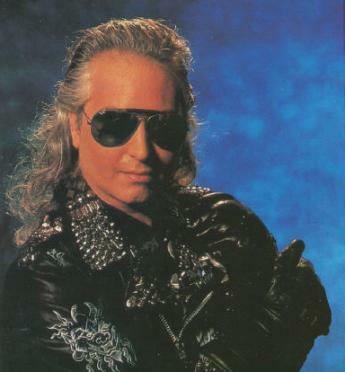 But he's also produced singles for a panoply of artists such as Air Supply, Billy Squier, Barbra Streisand, Barry Manilow, and The Sisters Of Mercy. And although his passport simply lists his occupation as "writer," he's directed videos, and written both soundtracks and scripts. Steinman's (brief) affiliation with Def Leppard ("They make Spinal Tap look like the Julliard String Quartet," he quips) contrasts strongly with his pet project - a feature film called Neverland - a uniquely Steinmanian (read dangerous) version of Peter Pan. Now Steinman is back in full force with Pandora's Box, a group made up of four belting female lead singers with the man himself writing, producing, pummeling the keyboards and providing the numerous spoken parts - another of his trademarks. A prematurely gray but still lion-maned 38-year old, Steinman is ebullient, endlessly entertaining and friendly. At first, his engaging personality seems at odds with the intense and proto-orgasmic kind of epic rock 'n roll he creates. But Steinman knows himself and his creative powers very well. Studying film and theater at university, he was a member of various bands in college, hammering the piano until his fingers bled. Having had a steady diet of the stalwarts of rock 'n roll and opera since his youth, Steinman's influences were clearly Richard Wagner and The Doors. But it is his love of groups like The Shangri-Las which has lead him to formulate Pandora's Box. "I wanted to do an all-girl group," says Steinman, "but I got really sick that all the women in pop music were Madonna clones. They were tiny, they were ornamental - there was something so thin about it. They all struck me as men's projection of women. It just seemed to me that there should be some balance to that. I remember loving the Shangri-Las when I was a kid. They were really tough - you could see the girls and the women in them. I just thought it would be great to do, plus I knew these great female singers. It just seemed to be the biggest trip of all." Outside of Meat Loaf vocalist Ellen Foley, the other three member of Pandora's Box are Elaine Caswell (who performed in "a tough, almost punk band"), Gina Taylor (who was playing Tina Turner in a New York show called Beehive) and Delira Wilde who had never performed before. "They were just singers I'd heard," says Steinman, "and they were powerful. And they are very sensitive - as I am - that they are not in the video [directed by Ken Russell] just singing backup" or "draped around like props." This four-way lead role will extend to live performances: "Rather than having them just standing there singing backup, one leaves the stage and then the other comes out and sings. At the end all four should be like different aspects of the same person. It's a concept I've always wanted to try; the four of them making up one person, like the four faces of Pandora." It's Steinman's love of teenage extremism that keeps the group's debut album, Original Sin, from being undiluted with maturity. "I was worried when I was doing the album - 'Does this sound too mature?'" Steinman laughs as he questions himself. "Adolescents are my favorite people. I just think that's the best time of life. Everything is twice as amplified, twice as intense, twice as important and I think things that are so important then are the most important things. The way kids fall in love, constantly and obsessively, and their love of simply basic things like volume, speed, intensity - I just think kids are more alive. I think it's a great woman's album as I've tried to write a lot of the stuff from the woman's point of view." Original Sin will not be released in the US until four months after its UK release - by Steinman's decree. If the UK success of Meat Loaf and Bonnie Tyler is any indication, however, Steinman is correct in thinking that British audiences are ready to appreciate and embrace his style. With Ken Russell directing their music video, Pandora's Box is being groomed for success. Touring, something Steinman hasn't done since Meat Loaf, is a possibility. But smash hit or not, Steinman has other plans. He'll also be producing the new ELO LP and, voice or not, working on a new Meat Loaf album. 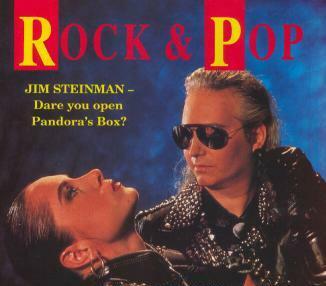 Despite his teenage emotions and his love for the musical extreme, Jim Steinman's attitude towards himself is surprisingly sensible and well-balanced - with a healthy self-cynicism thrown in. "Some of my friends say, 'Aren't you going to get married?' 'No.' 'But don't you get bored being alone all the time?' 'No, actually, I'm pretty interesting!'" Jim Steinman, the man behind Meat Loaf's classic Bat Out Of Hell (among other largish things), trots out a new concept with Pandora's Box: four lead female vocalists - Elaine Caswell, Gina Taylor, Deliria Wilde and Meat Loaf vocalist Ellen Foley - singing like real women to create a joyous, heady force when channeled through the teenage extremism of the master's imagination. Every track verges on the overwrought - but that's the idea. Sampling from classical music and classic rock 'n roll, Original Sin is a wild pastiche of glittering, ridiculous but always colossal rock. Whew!